Wait, has it really been nearly 2 weeks since I last posted?! How did that happen?! Okay, I actually know exactly how it happened. I have no time! Very, very little free time means less cooking and less blogging. Ugh. Only 6 more weeks of classes though, and then it's back to a "normal" schedule... Like, 40 hours a week! Amazing! I'll actually have time to blog regularly, cook new foods, work out more than twice a week, do some wedding planning (7 months to go! 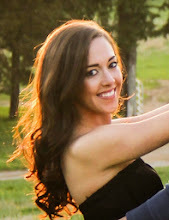 ), work on my dissertation, clean my house, practice yoga... I can't wait! Just gotta make it through. I can't say I haven't cooked at all though... It's just been mostly the basics. I've still been prepping all of my lunches (lots of spiced chicken being made around here! ), making some tasty dinners, and trying to fuel my (usually exhausted) body with healthy, nutritious foods. One of my best meals of late? Chicken noodle soup. A totally healthy version, too! And spicy! I wouldn't say I'm normally a huge chicken noodle soup person, but there are times when it's just perfect: like when you're craving something hearty on a cold day (the chilly-ness is officially here to stay!) and/or if you have a cold you need to kick. 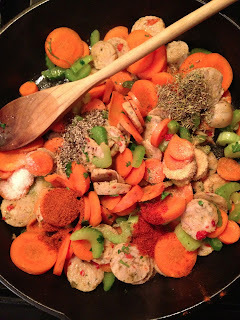 This version is particularly great when you're sick, because it's a spicy cajun version! The spiciness clears those sinuses right up and the heat warms your body. So comforting and delicious, and it's also healthy and nutritious. Just what your body needs when you're sick! This recipe lies somewhere in the middle between shortcut chicken noodle soup from a can and chicken noodle soup that requires you to spend all day cooking chicken and parboiling bones to make your own stock. Its taste is worlds away from the canned kind, but you don't have to kill yourself to make it (which you don't want to do if you're sick!). 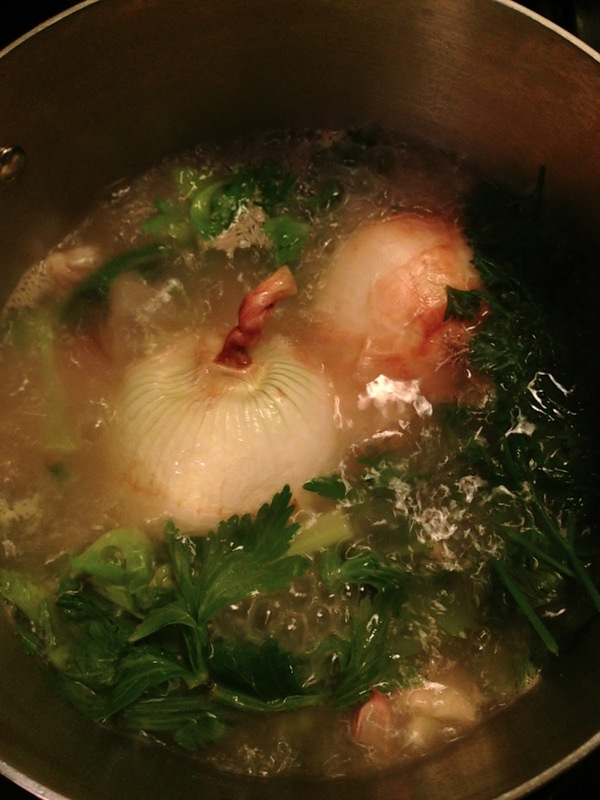 We get help from a store-bought rotisserie chicken and pre-made chicken broth, but we make it taste much more flavorful and home-cooked by simmering it with onions, carrots, garlic, parsley, and celery tops. The addition of spicy chicken sausage and cayenne lead to a wonderfully unexpected spiciness. Just wait until you smell that aroma filling your house as you cook this -- it's amazing! This soup is heavier on chicken and noodle than broth, which is how I prefer it. I found it easiest to eat with both a fork and a spoon -- a fork for the goodies and a spoon for the broth! If you're like your chicken noodle soup more brothy though, feel free to up the chicken broth in the recipe. 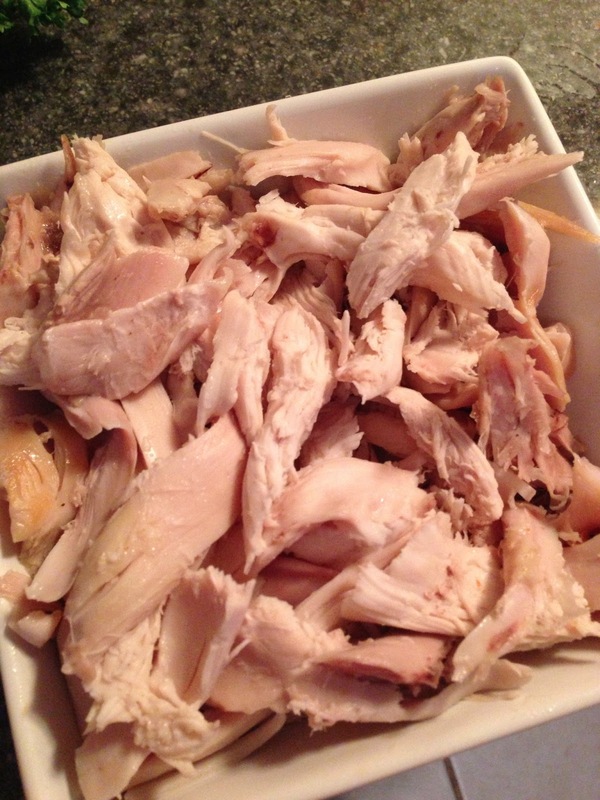 Pull all of the meat from the rotisserie chicken and set aside in the fridge. Boil 12 cups of chicken broth. Add the onion, garlic, bay leaves, a carrot, the leafy tops of the celery, and a handful of the parsley. No need to peel or dice anything yet- this part is just for flavor. Return to a boil then reduce heat to low, cover, and let simmer for about an hour. After an hour or so, drain the stock, reserving all of the liquid and discarding the vegetables and herbs. Actually, don't discard those carrots -- eat them while you cook! They're delicious. Return the liquid to the pot. Return the pot to the stove and turn heat to low. 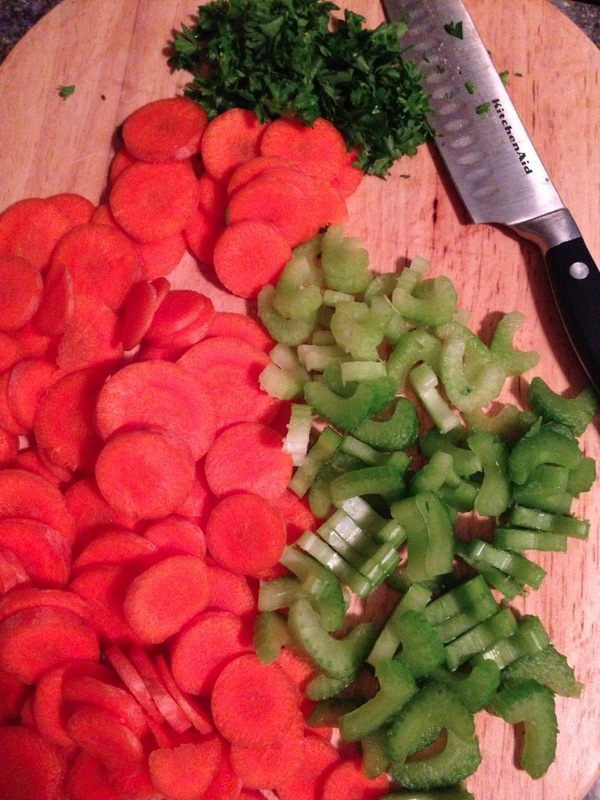 Dice your carrots, celery, and about 2 tbsp of fresh parsley. Also dice your chicken sausage into bite-sized pieces. Heat olive oil in a pan and add the veggies, sausage, and your spices. Sauté over medium heat until soft, about 8 minutes. 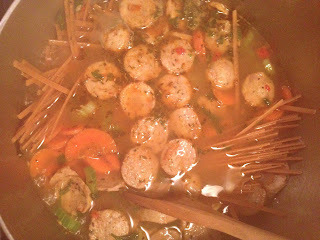 Pour all of that into the broth and turn heat to high. Once boiling, add your pasta. If you don't have enough liquid to cook the pasta, add a bit more broth. About 2-3 minutes before the pasta is done, add the chicken that you set aside. Cook until the pasta is al dente, then serve immediately. -Remove the all of the meat from the rotisserie chicken, discarding skin. Set the pulled chicken aside in the fridge until ready to use. -Bring the chicken broth to a boil in a large stock pot. Add the onion, garlic, bay leaves, 1 of the carrots (broken into several pieces), the leafy tops of the celery, and a handful of the parsley (be sure to reserve some though). Return to a boil then reduce heat to low, cover, and let simmer for about an hour. 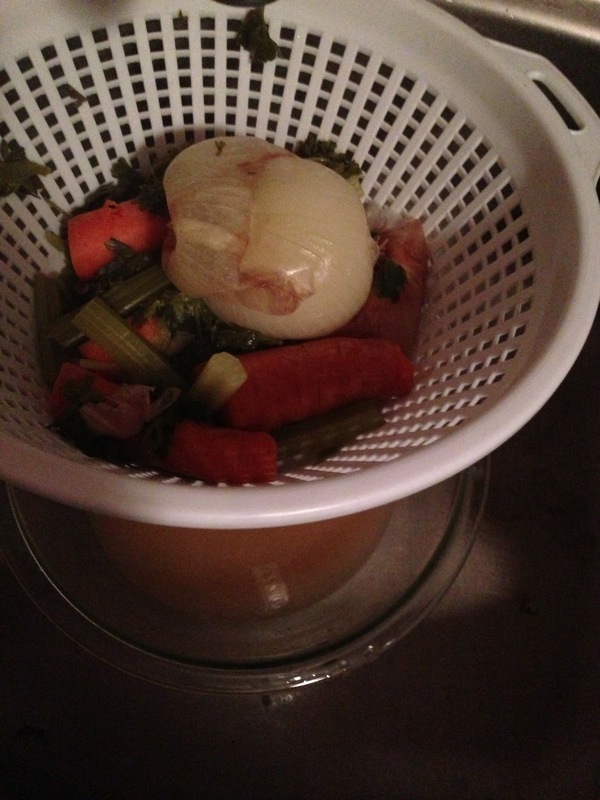 -After an hour, drain the stock, reserving all of the liquid and discarding the vegetables and herbs. Return the liquid to the pot. Return the pot to the stove and turn heat to low. -Dice the other 3 carrots into slices. Dice the celery. Dice the sausage. Finely dice about 2 tbsp of fresh parskley. -In a skillet, heat 1 tbsp olive oil over medium heat. 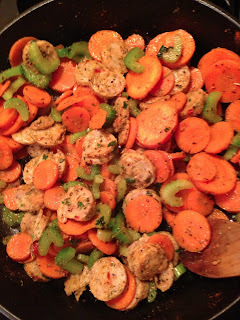 Add sausage, carrots, parsley, and celery. Sprinkle on the cayenne, paprika, salt and pepper, garlic powder, and thyme. Sauté until vegetables begin to soften, about 8 minutes. -Pour the carrot and celery mixture into the broth and turn heat to high. Once boiling, add the pasta. If you don't have enough liquid to cook the pasta, add a bit more broth. About 2-3 minutes before the pasta is done, add the chicken that you set aside. Cook until the pasta is al dente, then serve immediately. I love this recipe! But then again, when do I not love your recipes?? I'm sorry things are crazy right now! Hope they start to calm down soon lovely! yum - looks super tasty - I think I'll make it this Sunday when it's supposed to be a super chilly day! Exactly what I was looking for! My son has a cold & loves spicy food. I'm going to make it right now - thanks!